We had a great health insurance plan since 2009 and we liked it, but the cancellation letter told us it did not meet Obamacare (ACA) requirements. The new plans offered sterilization, abortifacients and other gravely sinful matter. We are switching to Medishare a Christian medical bill sharing organization. It’s not for everyone because they are stringent about preexisting conditions, but the good news is it is very affordable and they have an exemption from the government penalties. If you are like us, one of the millions who had their health insurance cancelled due to Obama, and need to look for new coverage you should check them out. If you click HERE my son and his family of nine will get a referral credit. Today we had great weather, not too hot or cold, just perfect. Everyone has already bonded into a fellowship of believers set on learning more about our Lord and Lady and the Church. 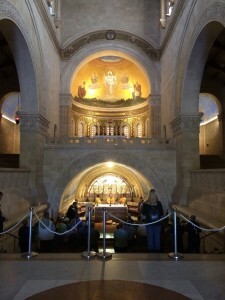 And we are reading the 5th Gospel – which is the Holy Land. 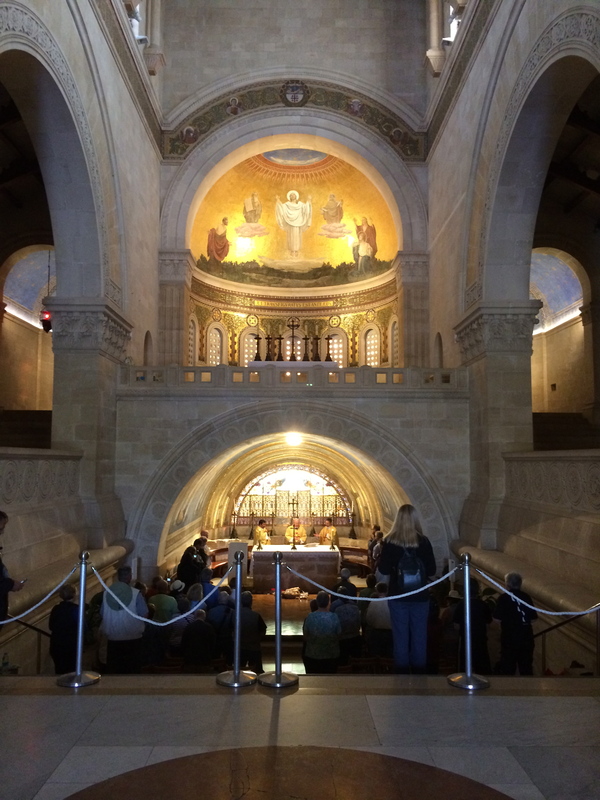 Today we began early to avoid the lines and arrived first at Mount Tabor, the Mount of the Transfiguration. We had Mass was Jesus was transfigured before his three disciples in the presence of Moses and Elijah. I gave my talk on the meaning of the Transfiguration and its relationship to Mount Sinai. You can listen to Msgr. Droll’s homily here. It was here the Angel Gabriel said, "Hail, Full of Grace"
Everyone was emotional at the renewal of wedding vows at the Wedding Church in Cana. Msgr. Droll did a marvelous job of explaining the beauty of marriage and all the married coupled renewed vows together. I gave my talk on the Wedding Feast of Cana and how the six jars became seven when Jesus died on the cross. Our last stop of the day was a third Rosary site – the Church of the Annunciation in Nazareth. 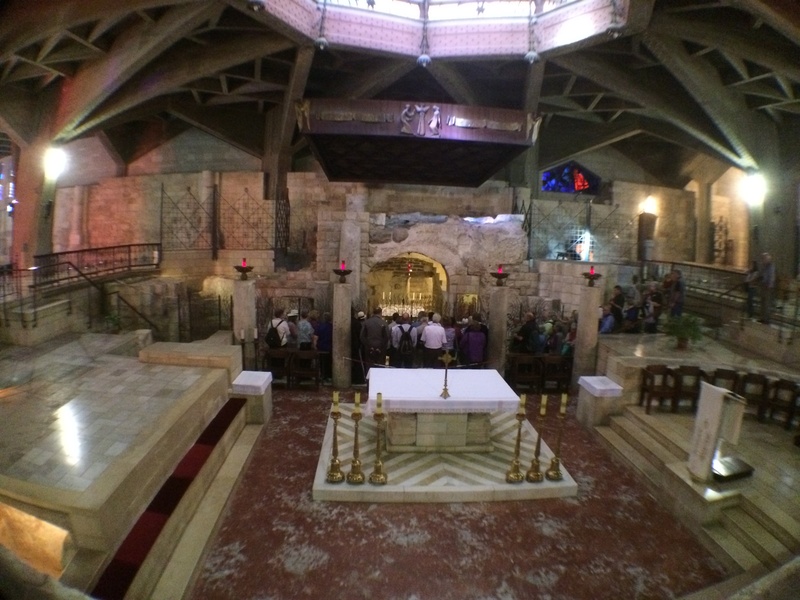 My friend Amer, who is our local guide, lives in Nazareth and the Annunciation is his parish church so I laid low so he could explain his own church but I did give one of my favorite talks “A Day in the Life of the Holy Family” at the cave where Mary, Joseph and Jesus lived. The late afternoon and evening were free. It was nice to see our pilgrims swimming in the Sea of Galilee, sharing a glass of wine watching the waves and I know that some took a nap.